In 1940, Dr. Juan Bautista Rael, a Stanford professor and a native of Arroyo Hondo, returned to his roots to record the music of northern New Mexico for the Archive of American Folk Song (now the Archive of Folk Culture). His compilation of the state’s rich musical heritage included a comprehensive study of New Mexican alabados, or religious/ceremonial hymns. “La Pasión” is an example of an alabado sung during Good Friday services. Alabados have long been a part of Penitente and northern New Mexico devotional practices. Buddy Holly and the Crickets recorded a version of this #1 hit on February 25, 1957, at the Norman Petty Studios in Clovis. The song went on to become one of the most influential hits of early rock ’n’ roll, and Holly’s trademark song. Petty’s studio, and his talents as a producer and engineer, created what came to be known as the “Clovis Sound,” and played a major role in developing the careers of a number of successful artists, such as Roy Orbison, Waylon Jennings, Jimmy Gilmer and the Fireballs, Johnny Duncan, and others. Everybody’s favorite outlaw and perhaps New Mexico’s most well-known personality, Billy the Kid became the subject of a Marty Robbins song in his 1959 album, Gunfighter Ballads and Trail Songs. Robbins was one of the most successful country and western singers of his time. This album, which also included the smash hit “El Paso,” established Robbins firmly at the top of the C&W charts in the early ’60s. 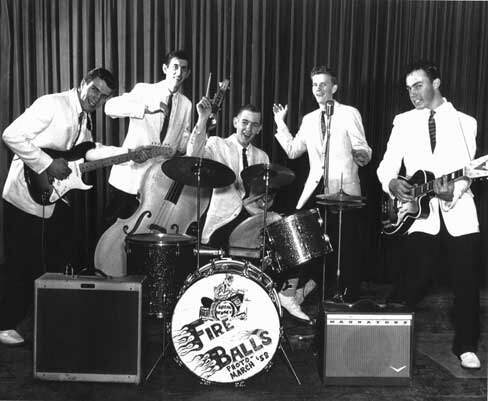 of Fire” at a talent contest at Ratón High School in 1958, a rock ’n’ roll band earned the name Jimmy Gilmer and the Fireballs. Five years later, the group reached #1 on the Billboard charts and stayed at the top spot for five weeks with “Sugar Shack.” They received a gold record for this hit, and put New Mexico on the pop-music map. Widely known as the “Godfather of New Mexico Music,” Al Hurricane began his recording career in 1967 with the release of his first album Mi Saxophone, which featured the single of the same name. Born Albert Nelson Sanchez in Dixon, his mother gave him the nickname “Hurricane” because of his propensity for knocking over household items. He began wearing his trademark eye patch after a car accident early in his career, which led to the loss of his right eye. He has released more than 30 albums in his career and was awarded a Lifetime Achievement Award by the New Mexico Hispanic Awards Association. The indie-rock band The Shins formed in Albuquerque in 1997, and five years later burst upon the national music scene with its debut album, Oh, Invented World. The album, which was recorded in the band’s home studio, featured fresh and quirky pop melodies and an irresistible energy and enthusiasm. Their 2003 album, Chutes Too Narrow, propelled them to further popularity. They have an album scheduled for release in 2012. Today, Beirut carries the state’s indie torch, but their recent hometown hit, “Santa Fe,” will have to stand the test of time before it cracks this list. The Black Eagle Drum Group, from Jemez Pueblo, recorded this album of powwow music, which won a 2004 Grammy Award for Best Native American Album. The group is made up of 20 Jemez musicians spanning three generations. They write many of their own songs in their native Towa language. Their album displays the essence of powwow music: a cultural, social, and spiritual gathering of native people mixing songs, drum beats, and dancing.